Funky First Grade Fun: Can You Be Funky in 2nd? Big news! I'm going to 2nd grade! The good news is that moving to 2nd grade was by choice. I have AMAZING students and parents and I'm looping to 2nd grade with my class! I am very excited and so are my students and their families. The bad news...it means changing rooms AGAIN. This will be my 8th time changing rooms in 14 years in my current district. I like to throw things away so I'll get over that and one of my friends down the hall likes to collect all kinds of "treasures" out of my trash can each time I change rooms. She might be a hoarder, but I still love her. I will still be blogging under Funky First Grade Fun (Funky 2nd Grade Fun just doesn't sound quite right). And...who knows what my next adventure will be? We still have 15 1/2 days of school left. It's the time of the year when students are getting excited about summer and I'm trying to do everything I can to keep them on task. One of the most successful things (at least for me) in my bag of tricks is the use of autograph bookmarks. 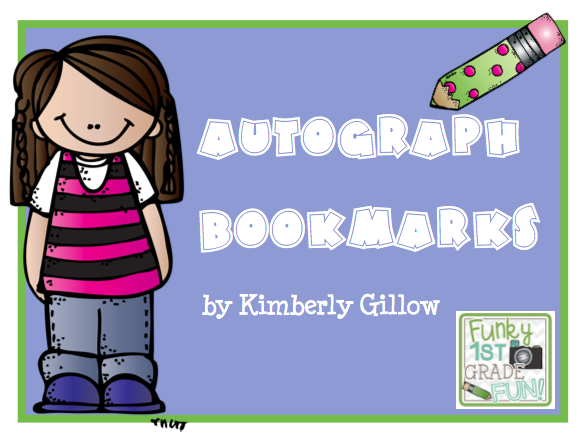 I made autograph bookmarks for my students this year, to help hold them accountable during quiet reading. During quiet reading time (and when my students are finished with their work), they grab an autograph bookmark. For each bookmark they work on, they are responsible for reading to one other student or adult in our classroom. We use Fountas &Pinnell leveling. So, I expect my students who read level H or under to read their entire book to a peer before getting an autograph. Students who are reading level I or higher are expected to read 10 pages of their book to a peer in order to get an autograph. In the beginning of 2nd grade, I'll use these during read to someone. I might even send some home for students to use with their parents. You can peek at my autograph bookmarks by clicking on the image below. 2nd grade will be fun, right? In the spirit of wrappin' up the school year...I went shopping this weekend. I bought new fabric for the bulletin boards in my new room and shopped at Schoolgirl Style for matching borders and giant pom poms! Ooops...all this "throwing away" made me feel like shoppin! Any advice for 2nd grade or for looping? Sunday Funday is about to end...guess I better finish up my plans for the week! Welcome to 2nd grade! I moved up from 1st grade a few years ago and I will never go back. Second grade is the best! Thanks, Courtney! I'm not gonna lie...a little nervous. But, I'm also super excited! Welcome to 2nd! I personally love it. And yes, you can definitely, without a doubt, be funky in 2nd! Get ready to have some fun! Thanks, Sydney! I needed this change and feel so lucky to be able to take my kiddos on the adventure with me. I'm moving to second grade by choice this year too. I'm both nervous and excited. I will be keeping some of my students and gaining a few new ones. Can't wait to see what new adventures we'll have! Kimberly - you will love looping - especially since it is your choice. I did it a few years ago K to 1. you are able to hit the ground running in September since you already know your kids and their levels - etc. It was so great. Kimberly, I looped from 1st to 2nd this past year (not by choice) and I was sure I would move back to 1st as soon as humanly possible! However, even with 2 first grade teachers leaving this year, I chose to stay in 2nd. Looping with my class was incredible! They made such gains and almost all were at benchmark by the end of this year. And I found that teaching second was SO MUCH FUN! Good luck!